This product has 15 ultra-bright amber LEDs per bulb. The package includes two turn signal bulbs and all installation equipment. (If you need enough to cover bike, front and rear, you will need to order 2 sets) This energy friendly ElectroPods that require low power consumption. The flexible neck is shock and bump resistant. 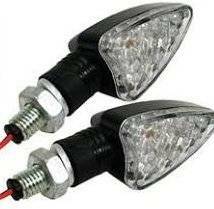 It is ideal for replacement turn signal bulbs for many sport bikes and street legal minibike applications. It is weather and shock resistant.